Review posted May 20, 2015. NorthSouth Books, 2014. 92 pages. 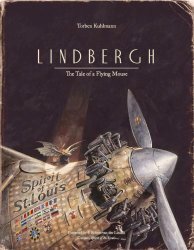 Lindbergh is a long-form picture book, for lack of a better way to describe it. We’ve got a story of a little mouse for whom life has gotten bleak in Germany. He wants to go to America, but faces many obstacles. After it proves to difficult to get on a ship, he decides to fly. Successive inventions (paralleling the history of human flight) finally result in a tiny plane capable of crossing the Atlantic. The story is simple, but the detailed, lavish illustrations make this book a feast for the eyes. The painting of the mouse taking off with an owl bearing down on him will give you goose bumps! There’s a short history of aviation at the back, and I feel confident there are details in the drawings about actual flying machines which escaped me, but won’t necessarily escape avid child readers. This is a beautiful book. Children who enjoy poring over detailed paintings will be richly rewarded. Comment on this review from the blog. Sonder is a German prefix meaning "Special."